In my pointless endeavour to become an adult my fiancé and I got a rescue cat at the tail end of 2016. We named her Miku and she can be an ungodly nightmare 90% of the time trashing my house. But every so often when she’s worn herself out and she lies down on the carpet stretching her body out and hiding her limbs I see how cute she is and all is forgiven. 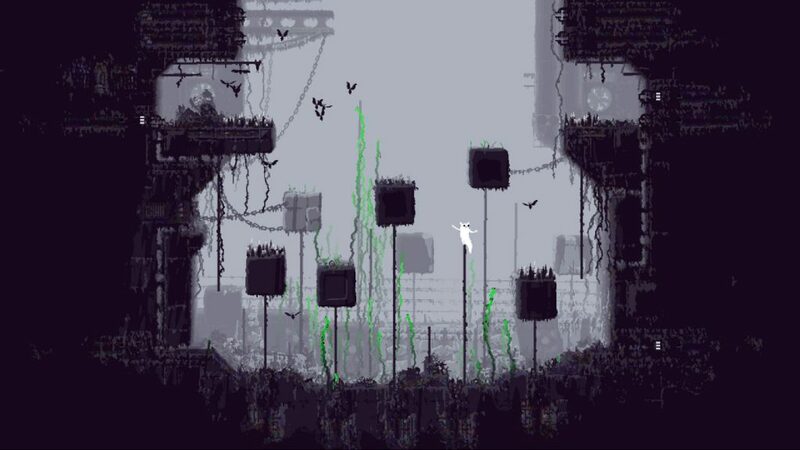 Rain World is so close to being that feeling in game form, something that is wonderful to look at during it’s quiet periods but a stressful experience outside of that. Slugcat, your avatar in the world of Rain World, is unbelievably cute and everything is so beautiful, but when the rest of the game is just an elongated raspberry being blown in your face is it even possible to look past the flaws? 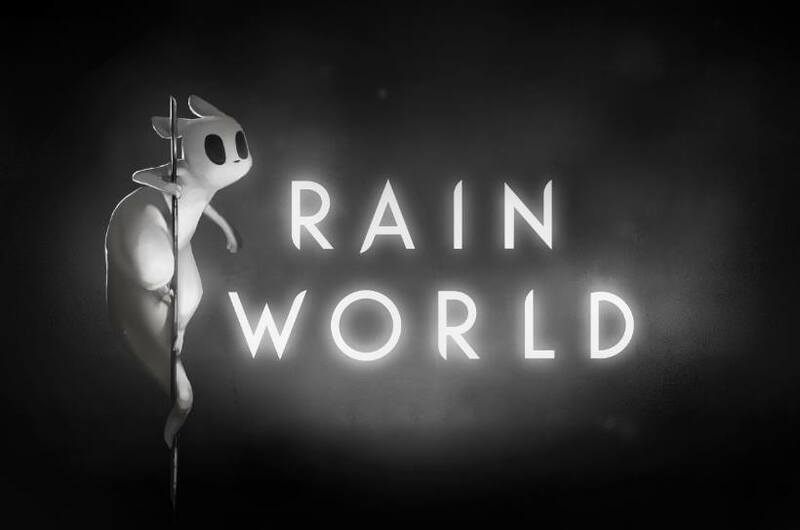 Rain World is a 2D platform survival game where you must traverse an oddly industrial, but uninhabited by humans, region to try to reunite with your family of slugcats. When you first load the game two things will occur to you, the first is that this may be one of the most impressively designed games in a long time. Pixel games have fallen somewhat out of fashion but the physics and art on Slugcat and other creatures is truly impressive, and with the backgrounds being reminiscent of detailed Amiga games from the 90’s there’s nothing to do but sit in awe. The second thing that will occur to new players is that you’ll have no clue what you’re doing. The tutorial is along the lines of a couple of screens that will indicate that you can power jump and how to pick up food and weapons to throw but outside of that you’re left to your own devices. It’s as if you are left to house sit for someone but when you walk into the house there is a note from the owner backwards and in Japanese, the cutlery is taped to the ceiling and the walls are on fire. There’s something about learning a world’s rules and restrictions yourself, the latest Zelda has shown that can be a joy; a loose objective and an environment that is unfamiliar. But when you aren’t even entirely sure of the buttons or what the HUD means you kind of start to glaze over in the first 20 minutes of playing. Hours and hours in and I still can’t say with confidence what the majority of the screen is telling me. In my time playing there have been patches that have addressed some issues with my early experiences but straight off the bat this game has one fatal flaw, it’s borderline unfair. Now in the week or two this has been out I’ve seen the alpha gamers have taken to the internet to spout off their usual ‘Git Gud’ attitude whenever anyone has anything negative to say about difficulty but that doesn’t apply to Rain World’s issues. 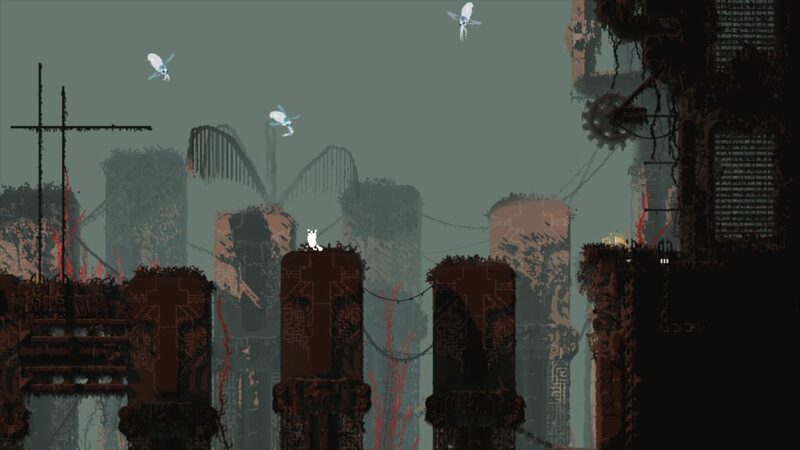 Hard games can be fun, difficulty can cause frustration but also the highest levels of satisfaction in a game, with Rain World difficulty causes boredom. A large mechanic in the game is to collect at least four pieces of each in game day to be able to fill your stomach enough to hibernate in set checkpoint areas. The hibernation pods are hidden around the world and easy to miss if you don’t notice that the usual three white dots to indicate access to the next area is replaced by a small white rectangle. The game saves when you hibernate allowing you to return to this point whenever you die, the problem is these areas are incredibly few and far between. This means that should you die after exploring for 20 minutes you will be sent back to the last hibernation with your map reset and with nothing to show for that time apart from another run through that area to where you last died which makes the whole experience, quite simply, boring. Death is waiting for you on every screen, whether it’s the random assortment of enemies that are procedurally placed on each run or the impending down pour that each storm brings. If you’re not back in a hibernation area when the rain starts you are simply dead. Another common cause of death is unwieldy controls that don’t react the way you input. When jumping for a ledge or pole only to not grab or for slugcat to not move in a direction you have selected when an enemy is approaching, it just feels like the game is out to get you. 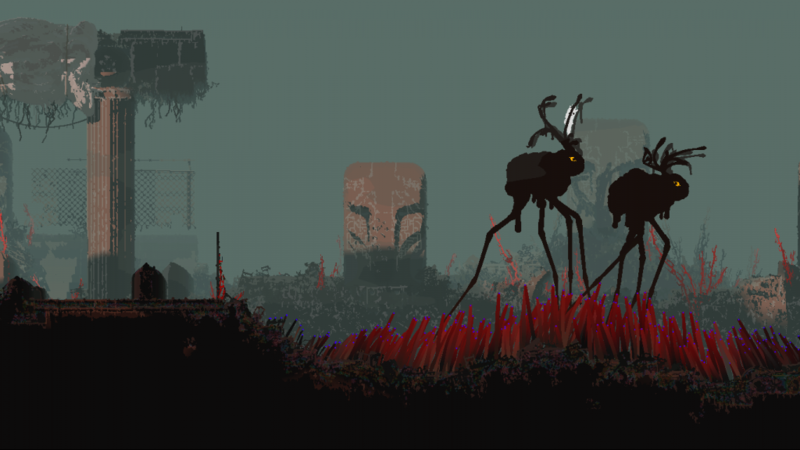 I heard talk of hundreds of different screens being designed for Rain World, and I’m sure each are beautifully designed, but the game almost seems proud of the fact that the vast majority of players are not going to see them. Going back to the ‘Git Gud’ mentality we can look at other difficult games and see there’s a couple of ways to handle different skill requirements. Hotline Miami, Super Meat Boy, Spelunky and other games of that ilk all did a fantastic job of having a quick death turn around. When dying hitting one button instantly took you back to the start of that screen meaning that you never felt like you were failing, you were just experimenting until you found the successful solution. Dark Souls tells the player nothing but it follows a logic you can understand, it had unfair moments where you could be jumped on or trapped but if you were extremely slow, cautious and boring you could pre-empt those issues. None of this seems possible in Rain World.